The plans & adventures of Teal in the Sky with Diamonds. My Guide to Plant Survival: In which I write about trying to save plants and my Plant-y Friends give me advice. These pictures were taken after cleaning all the dead leaves off the plant & out of the pots. Next they were given a huge, slow watering. The diffenbachia was moved into my office with north & east facing windows. The diffenb. has been named Fernando. This has garnered interesting responses from the kindly people who pass through my office. My early response as to why I named the plant Fernando was, "Every thing sounds better in Italian." But, now I just laugh and think, "I should write that one down!" and most frequent response is an incredulous look followed by uproarious laughter. 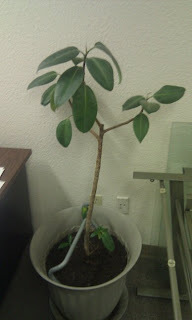 The Rubber Tree Plant is so far unnamed. It is so ugly I can't even move it into my office. Also, I would feel really guilty taking not one, but two plants from another office. But the real reason is UGLY. At least Fernando has the hope of handsomeness in his future. The Rubber Tree will always be a wall flower. The Rubber Thing keeps losing leaves. Thank goodness no one is trying to make tires from this thing. Today yellow spores showed up all over the top of the soil. Clearly, the water shocked that one too. So, a day or so has passed since I moved Fernando into my office. I think he looks perkier. I have to fight the urge to keep watering him. Just the one solid watering probably shocked his system. Like when we eat really good food that is just way richer than we are used to. The eating was good, but the bathroom is now home. As usual, I digress. What also showed up today is a 5 gallon bucket of soil from the former caregiver. I am hesitant to use soil filled w/ weeds from his backyard. He says, "just put it on the bottom and all the weeds will die." I think we need some rabbit manure to mix into the soil and make it really good. He says he added charcoal and some other stuff, possibly chicken manure and thinks it will work great. As you can see, different planting philosophies abound around this office. I will have to take pics of the soil to get everyone else's opinion on this. Not to muddy the waters, but there is a third opinion chiming in also. You know when you make something REALLY COOL, but maybe not the prettiest to look at. Then you go to show it off and there is someone who made the same thing only their's actually looks like the magazine picture? Yeah, imagine that with plants. To set the scene--I like to rescue plants. I get bored of them quickly and love to give my now healthy plants away as gifts. I figure plants are like children that you are allowed to give away when you get tired of them. That means that frequently my plants look a little on the downtrodden side. After all, they are in some stage of getting rescued, so cut them some slack! I brought 2 of my "project plants" to work before I out-n-out stole Fernando. One plant is some cuttings off a VERY healthy plant on my windowsill that I rooted in a cup of water then potted up & brought to the office. Kinda tiny, kinda spindly--great potential. The other is my Avocado plant that I grew by putting the avocado pit into my vermicompost and vwaalaa, a lovely plant. However, since I work all day the poor guy has been neglected. He went through an especially dry season recently and that is when I decided to bring him to the office so I could keep a better eye on him. Clearly, I will have to take some pics of these lovelies. But back to that 3rd opinion. I work with intelligent people. That is why I like my job. But do they have to be intelligent and good at stuff? Probably not, but apparently several of them are. This fellow seemed to be rather normal. Then he walked in a said, "Is that an Avocado plant?" No one knows what an avocado plant is. At least, not normal people. Heck, I forget what kind of plant it is from time to time. 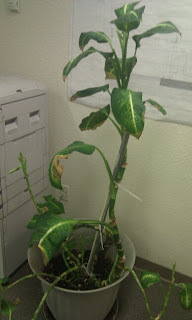 This guy says he has a plant project he is working on in his office. So I go look. He is twining plants around each other to make some plant sculpture! His plants look ready for a photo shoot. My plants look like they just avoided getting shot. Sigh. Maybe I'll listen to his plant-y opinions. Back to the Rescue Project. I am going to count on my plant-y friends to help me along on this journey. You can chime in here on the blog or on FB. Already I have been aided and abetted by identifying what the 2 plants are. Thank You! I am still a little confused on whether it is a Rubber Plant or Rubber Tree and whether that makes a difference. The next step is the repotting. We have soil provided by FC (former caregiver) counter-balanced w/ my hesitance to use old, dirty dirt. There was a little bit of mockery about buying soil at Home Depot and I will try not to take that personally. I really want to mix in some rabbit manure or finished vermicompost. Sadly, since the fruit flies took over the vermi. I haven't been keeping it going so there isn't really much of that to use. But damn, there's a lot of rabbit manure around here. The next problem is whether the Rubber Plant can survive getting some of it's stem buried or if that will suffocate or otherwise harm it. In general, I know the rule is never add soil to the top of a plant's dirt. But, the RT's roots are showing on the top and I feel a little like someone's slip is showing--there is pain in mentioning it, but in the long run the owner is so glad you told her. You can see from the picture that there is lots of room in the pot to add soil. I will probably take it out of the pot, loosen up the outer soil & get rid of a bunch, fill the bottom of the pot w/ rocks, layer of soil and then put the plant back in w/ new soil all around the edges. Clearly, I'm gonna need a tarp. It was casually mentioned today that in "the main building" they hire professionals to take care of the plants. I wonder if that was a hint? Oh look, I found my blog. After several botched attempts, I even managed to sign in. I finished something today. It feels so very good! When life is difficult, I lose my ability to create. Therefore, I stop sewing, knitting and anything else that might be good for me. Currently, I'm not even running. (there was a strange injury one day...but that's another story). So, I consider it a triumph that I picked up my fabulous green sweater "Bonnie" from the Twist Collective and sewed it together the other day. The collar was even faster than I thought to knit and VWALAA! It is done. This is the pattern picture--not mine. Though mine looks shockingly similar. I wish that I had great pictures, but I haven't even blocked it yet. I did wear it all day though. Mission Falls Yarn is gushy and quishy and soft--I love it!! I work on a computer all day long. That doesn't exactly mean I know how to fix computers or make them do what I want them to do. This is shown by the cruel position I currently sit in. I am typing happily away on my personal laptop while my work laptop issued for an upcoming business trip (I love saying that, it makes me feel official.) sits next to me in silent rebellion to everything I try to make it do. I am supposedly testing the wireless capabilities. I think the computer is testing the difference between me and an ape pounding on it's keyboard. I think the computer needs a name so I can feel guilty for hating it. Then maybe my attitude will change. Blackbeard seems appropriate. BB for short. BB is supposed to willing talk to my home wireless network. Perhaps I should be glad the general public can't pirate my home network very easily since I, the owner, can't seem to pirate it. It gets humorous to the point of pain as I search the Internet for a picture of what my wireless adapter (only to be used if I can't get the wireless working) actually looks like installed in the little slot it is supposed to go into. Logic would say that it should slide into the slot till only the end plastic shows, all metal being hidden. But the slot doesn't let it go in that far and logic cannot always be applied to computer based endeavors. So, I chose sanity over success, decided to write about something other than fiber adventures and feel much better for having vented all that into the stratosphere. Blackbeard and I will have a great trip. I know it. I just have to move past this and figure it out at work--or rather, have the computer guru at work figure it out. I want to eat whatever I want, whenever I want and not worry about it. So I run. Probably not enough. I thought I was doing pretty good. Maintaining would be the word I would use to describe what I was doing. The problem arises now that I have a running partner. Yes, you read it right. Those elusive things people talk about having. Usually it is in the past tense and goes along the lines of "When I had a running partner I ran 8 times a week and was twice as fast as I am now..." and so on. I run once a week with my running partner and I am feeling it! You run different when there is someone there who might not be as tired as you or as slow as you or as freakin' lazy as you. I say that with a smile because I think most running partners feel the same thing--so it all evens out. Everyone runs harder than they would alone. And on this rainy day in June I climbed a mountain I would not otherwise have climbed. Now, I can't seem to get up and move over to my sewing machine for my other planned activity of the day. I discovered today that my new running partner is a mountain climbing machine. My lungs conked out after the first 15 steps of near vertical powerline and I just tried to keep up and still get enough air into my body to stay upright. The other nice thing about a running partner is that whole 'conversational pace' thing. I never knew what that was because I don't run w/ people very often and when I do they are my zippy-fast friends who can sing an opera while running at my pace. Actually, when I did run w/ a singer it was really nice b/c she could keep the bears away with loud (very good) singing and I didn't have to make a sound. My running partner and I are (I think) fairly evenly matched (Except for that little climbing problem she has.) and we don't like bears or any other kind of wildlife, so we have to keep talking while we run. I think this slows me down, but in a good way. I am now running at a conversational pace and not going-as-fast-as-I-can-and-not-fall-down pace. The GAFAICANFD pace tends to result in really slow second half's of the run. Anyways, now that I can't move I don't know whether to blame it on the run/hike or on the curry soup I ate afterwards. I think I will go get some chocolate to tame the tummy. I am forming a new wardrobe. 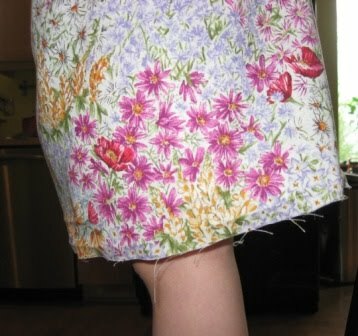 I can't afford to actually go buy a new wardrobe, so I am sewing one. I have lots of fabric in my stash and it is time to USE IT UP. Those words are difficult to type. Like the true hoarder I am, I hate to part with my fabric. What if there is a better project out there? Is this really what the fabric was called to be? I bought it to make something else, will it mind changing purposes? These are the questions I ask my fabric before cautiously cutting into them. Then there are the left overs. I hate to throw away my scraps. What if I actually make good on that desire to make a scrappy quilt one day? I will NEED those scraps. I keep getting distracted on my way to a new wardrobe. 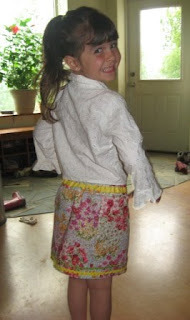 Most of those distractions come in the form of a 6 yr old who wants the scraps turned into skirts for herself and/or her dolls. As the pictures show--I caved. 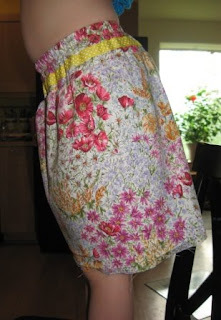 It looks suspiciously like the skirt I made myself last week. In fact there were a few complaints that it wasn't identical to mine. There were a couple humorous design dilemmas along the way. The first was the hem. It was TOTALLY uneven. I then moved back and realized that a little body with a cute little derriere and a round little tummy sets the waistline completely out of level. I could either sew to match the little belly or just hem it evenly and be done. I just sewed it up. We were out of yellow tulle so she didn't get a petticoat underneath. Now we have matching outfits. I never really wanted to match my 6 yr old. But now I do. Because I love her. She made me do it. Isn't she the cutest thing you have ever seen? Now that I leave the house to go to work every day I have discovered that I can't wear the same pair of sweat pants for 3 days. The office I work in is pretty stinkin' casual in the fashion arena, but I like to dress for me--not according to what everyone else is wearing. I know, none of you noticed that over the years. Lately, I have decided that I like wearing skirts & dresses and I want more of them. Luckily, I received a bunch of Athleta & Title 9 catalogs the other day and thoroughly enjoyed looking through them. The prices were not so enjoyable. I don't really have a clothing budget so I decided that I probably could make myself a couple nice skirts/dresses and not pine over lack of funds. 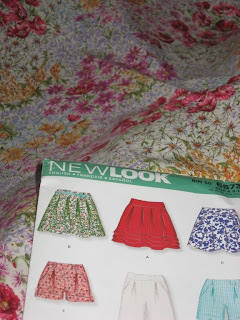 In fact, I have an entire room full of fabric and I am sure some of it could be put to good use draping my body. One box in particular fascinates me. 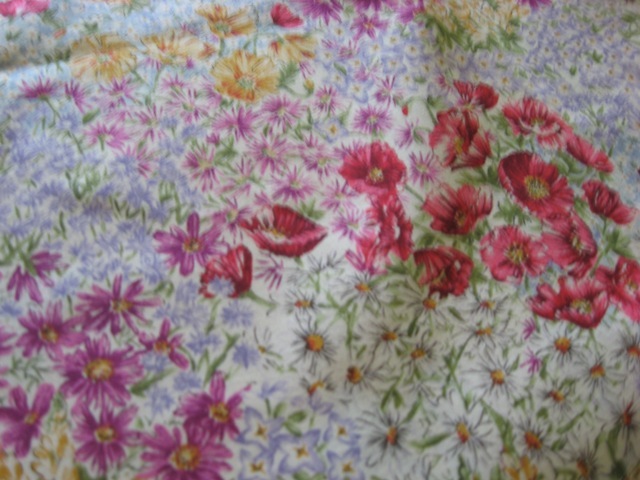 It is full of 90's floral fabrics from an anonymous source. I have kept them waiting for inspiration to strike. Clearly, this was the day! I even have a box of patterns to go with all the fabric! 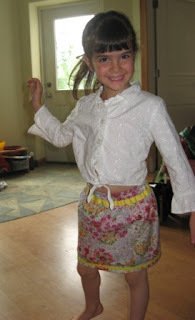 The patterns have some modern styles mixed in with the clearly 90's fashion suggestions. 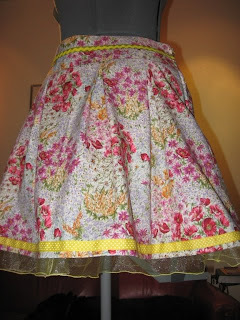 So, I found this cute little skirt pattern and decided to transform the old fabric into a skirt with a little pizzazz. Rickrack is a must in adding pizzazz. I also have a couple boxes of trim from my late grandma's sewing supplies. The green trim behind the rick rack is antique hem tape--just what the skirt needs! A little bit of polka dot is also key in adding pizzazz. But the Pinnacle of Pizzazz, as every 5 yr old knows, is TULLE!! This skirt would have an under skirt of tulle peeping out from under the floral overload. Sadly, I didn't take pictures of all the trim before sewing it up. 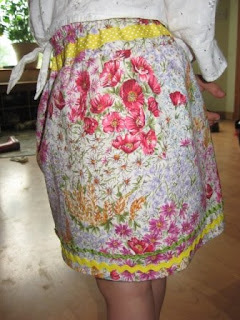 But here is Bertha w/ the finished skirt on her! And here I am heading off to work in the morning!! Nothing like a new skirt for less than $5. I like to think of myself as a Commuter Runner. You know, one of those people who run to work instead of driving their car. I don't actually run to work. I live almost 30 miles from my work--I would die running to work, therefore defeating the purpose of going to work in the first place. I do sometimes drive into ER (not The ER, just the town of ER) and catch the bus the rest of the way into work. Then I walk 4 blocks or so through a part of town I am very glad is still asleep and not trying to sell me anything, to my office. To get home I have options. I can work 20 minutes later, walk 2 blocks further than the morning walk and catch a bus back to my car. People are out and about after work and I don't really like this option. The proportion of Cadillacs to slummy apartments is way too high for my comfort level. I like to take option #2. After work I slip into my running clothes. Load the vitals like ID, water & knitting into my little backpack and run out the door, past the dealer's park, across several busy streets and down to the fabulous trails that weave through the Anchorage greenbelt and head to downtown to catch an earlier bus. This gets me home 15 minutes earlier, which is 15 more minutes with my kids I recapture from the working day. I also get a 2-3 mile run in, which is good all around. Actually, rather miraculous. But the other day...it all went horribly wrong. Don't get me wrong--I was not accosted, spat on or otherwise injured. In fact, I was probably never in danger. I just FELT like I was and that makes all the difference. It started with my usual fly-by-the-seat-of-my-pants attitude towards life. This is difficult when you are relying on a bus to get you home and the bus is on a strict schedule. But I digress. I worked late and thought, "No biggy, I'll catch the later bus. The last one is at 6:08. No problem, I'll get a long run in." So I head off on a glorious sunny day and decide to stay on the trail system longer than I normally do and enjoy running through the woods next to a creek instead of on cement sidewalks next to traffic. When I would get off the trails I left up to how I felt. See, there's this little airstrip that I needed to decide which way I would run around. Either way I would end up at the far end catching the last bus at the last stop as it headed out of town. I COULD NOT MISS THIS BUS! One way was probably shorter, but all on pavement in bad neighborhoods. The other way might be longer, but most of it was on the trails and then through a lighter traffic area in a better neighborhood. This in retrospect is a no brainer. Trying to make this decision with tired legs and a bus to catch was a bit more difficult. I opted for the shorter route because I really didn't want to miss the bus and I didn't know how much longer the pretty way would be. With my sense of distance it could be 2-5 miles further and I wouldn't know until I was still running at 9pm. I get off the trails onto the largest road leading out of Anchorage. 4 lanes of rush hour traffic and a sidewalk that would not have fit a full size stroller. On my right, the worst neighborhood in Anchorage. It makes my office neighborhood look like innocent suburbs. I could either run on Ingra (the busy street) or cut through the 'hood. I opt for Ingra. Safety in public spaces and all that. When I finally get to where I can get off the street I realize I am exhausted from being so tense. However, the bus doesn't get to the stop I'm at for 25 minutes. I am NOT standing here sweating for 25 minutes. I decide to run down past Merrill Field (the little airstrip I mentioned before--also one of the busiest airports in the NATION!) and catch the bus at the far end as planned. I could run inside the fence around the airport and look at all the pretty planes as I ran, wasn't there a frontage road or something? Actually, no, there isn't a frontage road. And the fence is all locked up now. There is a really wide sidewalk with a cement wall on the right and 4 lanes of rush hour traffic on the left. A runner's dream. The joy of running by rush hour traffic is that most the time the cars are sitting in one place. So I got to be passed by cars which I would then pass and then they would pass me again...you get the picture. Hot sun, hot cement, loud traffic that won't go away. I just kept running. Amazing how fast you feel you are running when passing cars. I sprinted the length of the runway and made it to my bus-stop with 10 minutes to spare. It has been 2 days and I finally felt up to seeing how far I ran and how much longer the pretty way would have been. I ran 4.5 miles on cement. The pretty way was a mere 1/4 mile longer. I could have run it and had 7 minutes or more to spare. Lesson learned--I will track my route BEFORE I leave the office. Thank goodness the only excitement on today's run was a bull moose. I know what to do with those guys. I spin, I knit, I run and I laugh. This is my life, well, this is the funny parts. And the parts I am passionate about.